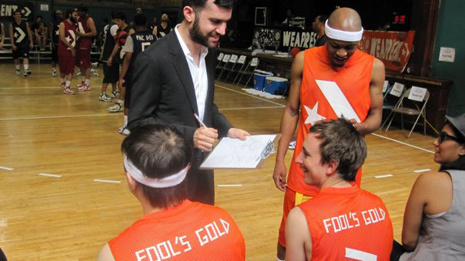 Last week Fool’s Gold was proud to take part in Converse’s 1st annual “Band Of Ballers” tournament. As player/GM (ha!) I put together a scrappy team including Donnis and soopamanager D Solo, Sammy Bananas, and DJ Jayceeoh. NCAA experience, mustaches, high socks – we had it all. 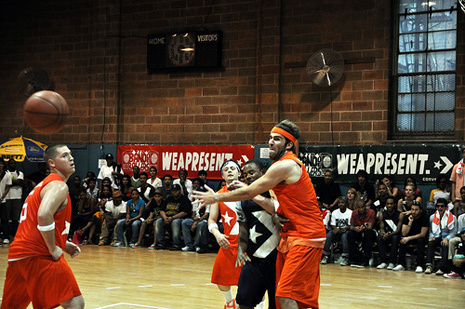 A-Trak suited up like a French Canadian Pat Riley on the sidelines as coach, and we took on the competition with championship swag while Cipha Sounds soundtracked it Miss Info and FG fan Peter Rosenberg did play-by-play. Did I mention there were video girls? Spectacle. Game 1 was a resounding FG victory against the Mad Decent team, followed by a Game 2 loss to Jim Jones and fam. We still made the semi-finals though, where team FG sweated out a heartbreaker of an overtime loss (the only game to hit sudden death!) to Pac Div. 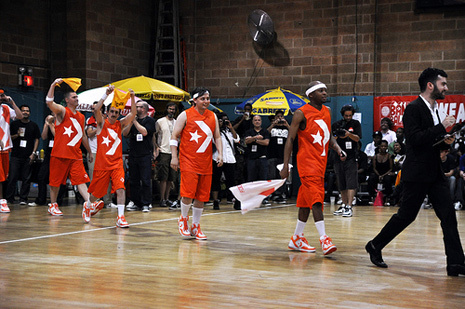 They in turn lost to Jimmy’s team in the finals. Ah well, there’s always the next tourney. 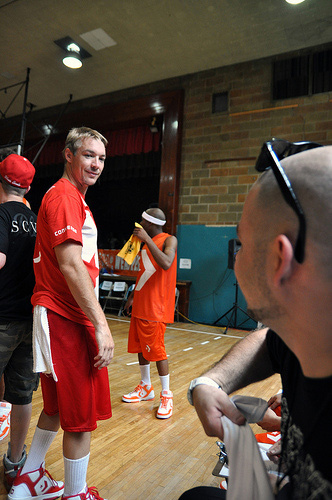 We played hard, had fun, and came away with a year’s worth of bragging rights against Diplo. Twitter that! Check out the recaps from Village Voice, XXL, Dime, Complex, Nah Right and Miss Info’s blog. 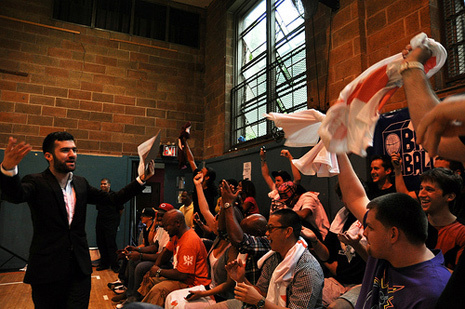 You can also peep our intern Loren’s exclusive pix from the stands. More links as we get em, Hot 97 video and some select photos after the jump.